Meta Tag Templates - Click, Edit & Done! Add it Anywhere. Edit Everywhere. Welcome to the next generation of content management for RapidWeaver. Everything about Armadillo has been refined, improved and carefully crafted to offer the best experience possible. 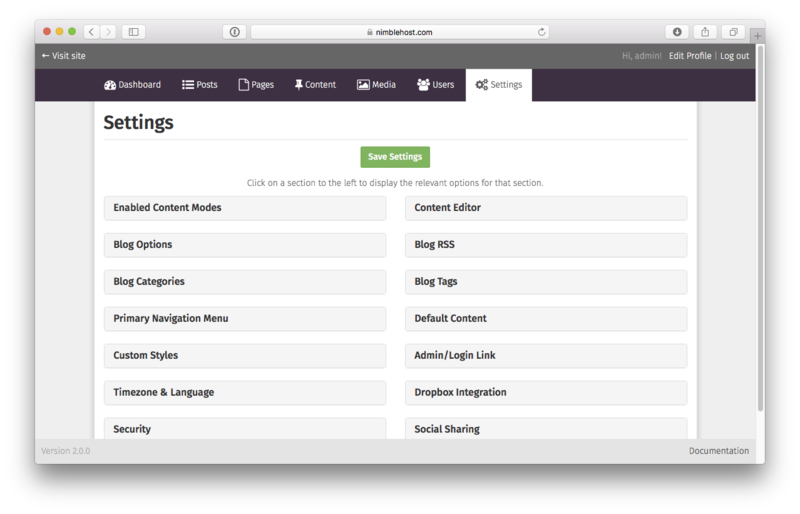 New in v2.5 is support for multiple blogs on a single site - all managed together with the rest of your Armadillo content. Each blog is independant of the others, yet there’s no need for separate logins or databases. 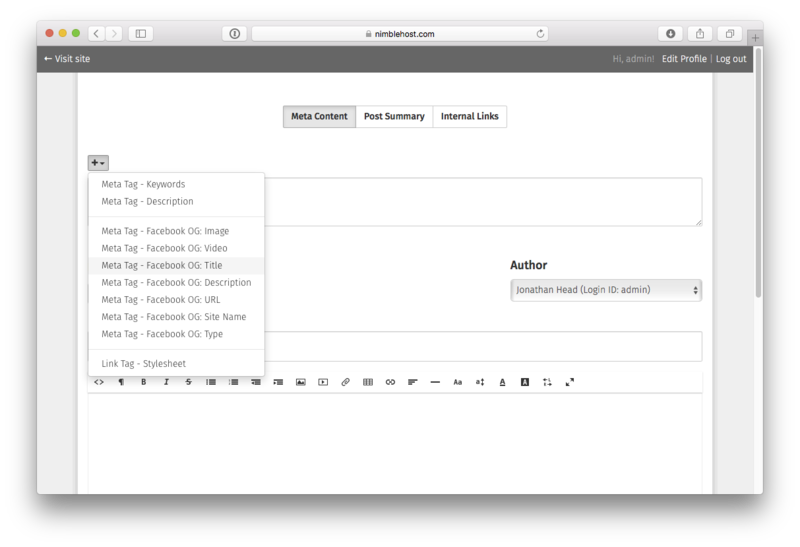 Wtih Solo Content in Armadillo v2.0 remotely editing specific portions of your website content is a simple task that can be accomplished anywhere in the world, from any type of device. Watch the video below for to see a quick introduction about what’s possible with Solo Content. If you are upgrading from v1.x to v2.0, make sure to read our Upgrade Guide before continuing with the upgrade process. New in v2.0, this is a new type of content that can be added anywhere, on any Stacks page of your RapidWeaver site. Find the content you’re looking for in a snap, with sortable columns and a built-in search function. Armadillo includes localization support for twelve (12) different languages - English, German, French, Italian, Japanese, Spanish, Dutch, Polish, Finnish, Bulgarian, Swedish, and Czech. Freshly re-designed, the new dashboard is fully responsive. Access it anywhere in the world from any device. Get your groove on with the beautiful split-view Markdown editor, perfect for focused writing. If your web hosting plan supports PHP 5.3.1 or greater, then you can sync the latest backup file of your site's content directly to Dropbox. It's built-in and super simple to use. 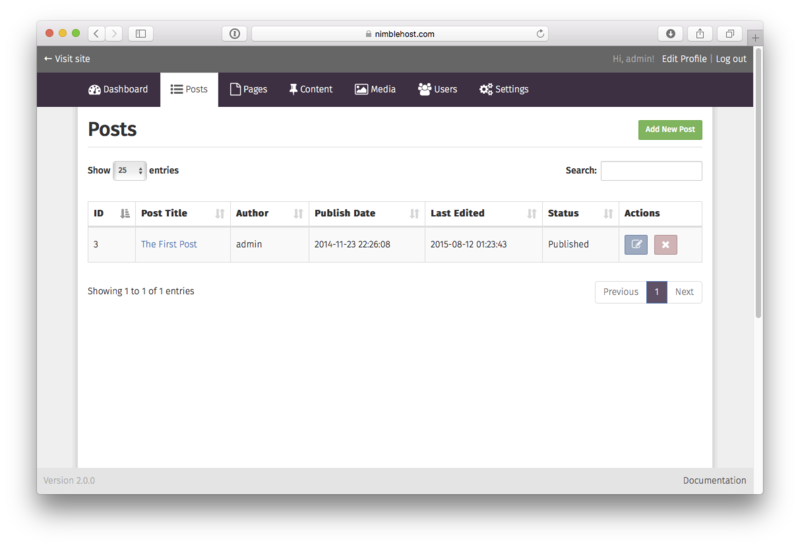 The first, custom-built, RapidWeaver-specific content management system. Uniquely flexible, and hand-crafted from scratch to work seamlessly with RapidWeaver. Want to use it simply as a remote blogging platform, accessible and updatable from anywhere? No problem. Or perhaps you want to add new pages to your site, edit them on the fly, and remove others? Got you covered. But what if you want to upload videos, images, pdf and text files - the whole nine yards - and be able to link to those files in the new pages and posts you create? Easily done. How about creating new users? Editing and removing existing users? Logging in remotely from any browser connected to the internet? Needing to reset your login password? Yep, all here. Yes. Really. 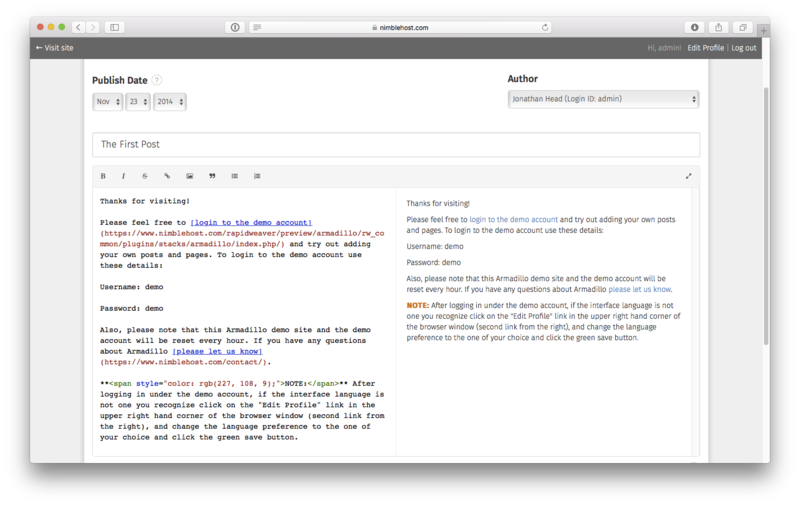 Try the live, online Armadillo demo for yourself, and discover what's possible. Armadillo is compatible with all modern browsers, including Safari, Chrome, Firefox, and IE9 or later. Most typical web hosting plans meet the requirements listed here. For a list of web hosting companies with confirmed compatibility, see the Armadillo Online Manual. This list is constantly being updated. Please contact us if you have questions or would like to submit your hosting company for inclusion.